We know this is a really long article, but it is extremely important--Senate could vote on Public Option as soon as next Thursday! These 2 articles are definitely worth your time. After you have read them, please, take some time to write/call/email any/all Senators and tell them "NO PUBLIC OPTION". Send emails to both Dems & Republicans (Olympia Snowe, R-Maine, is on the fence right now). The Washington Post front page blares today: “Prospects for Public Option Dim in Senate.”  Don’t believe it. Yes, the Senate Finance Committee did vote down two amendments that each would have added a government-run insurance plan to the committee’s health care bill. But two key Democrats who voted against Sen. Jay Rockefeller’s (D-WV) public plan, Bill Nelson (D-FL) and Tom Carper (D-DE), voted for Sen. Chuck Schumer’s (D-NY) version. According to an independent analysis  of Senate Democrat public statements on the public option, that raises the number of Democrats on record supporting a public option from 47 to 49. Moreover, Sen. Tom Harkin (D-IA), chairmen of the Health, Education, Labor and Pensions (HELP) Committee, told the liberal “Bill Press Radio Show” yesterday that Democrats “comfortably”  have the remaining votes to reach 51 and pass a public plan once the debate moves to the House floor. So just how close are we to being inflicted with the Obama/Moore dream of anti-capitalist, competition-free, government-run health care? Closer than many realize. Multiple sources on the Hill have told The Foundry  that as early as next week, the Senate could be debating Obamacare. Senate Majority Leader Reid has stated an intention to take the HELP Committee product and merge it with the Senate Finance Committee markup that is expected to be over by this Thursday or Friday. Their plan  is to proceed to a House passed non-health care bill to provide a shell of legislation to give Obamacare a ride to the House and then straight to the President’s desk. * According to a Government Accountability Office, state and federal officials failed to detect $65 million in Medicaid prescription drug fraud , including thousands of prescriptions written for dead patients or by people posing as doctors during 2006 and 2007. * A historic bridge at Bill Clinton’s Presidential Library is slated to get $2.5 million  of federal stimulus money. * The Center for American Progress, a liberal think tank with close ties to President Barack Obama , is releasing a report calling on Obama to further break his ‘no tax increase on middle-class families’ pledge. * A former ACORN field director testified in court  yesterday about extra payments to Las Vegas canvassers for bringing in 21 new registration cards in a day. * In 2008, the median household income in the United States plummeted 3.6% from the year before, and the percentage of people living in poverty soared to an 11-year high , according to U.S. Census data. President Obama and liberals in Congress seem intent on passing comprehensive health care reform, even though polls suggest it is unpopular with the American people. And despite the potential political risks to moderate Democrats, the President and left-wing leadership in Congress are determined to pass the measure using a rare parliamentary procedure. We just threw the remote at the TV we're so angry!!! Cap & Trade— is it helping the environment or a national energy tax? Senator Kerry the other day said he didn’t know what “Cap & Trade” was; he’s calling it a “Pollution Reduction Bill”. We call it “Bull”. “One reason the bill faces an uncertain future is concern about its cost. House Republican Leader John Boehner has estimated the additional tax bill would be at $366 billion a year, or $3,100 a year per family. Democrats have pointed to estimates from MIT's John Reilly, who put the cost at $800 a year per family, and noted that tax credits to low income households could offset part of the bite. The Heritage Foundation says that, by 2035, "the typical family of four will see its direct energy costs rise by over $1,500 per year." Today, “Senate Democrats on Wednesday introduced a sweeping bill aimed at combating climate change, pushing forward with President Obama's call to tackle global warming even though Congress is waist-deep in debate over health care reform." So, the bottom line is they know that it is going to cost all of us and extra $1,761 per year and yet they still want to ram this through? Do you have an extra $1,761 just laying around for the government to take—we don’t. Call/write/email the White House/Senate/Congress and tell them to vote “NO” on this legislation as it is currently proposed. It’s my money and yours, don’t let the government take anymore of it away! If it’s good enough for the Government, then it’s good enough for us too! Do we live in a "Do as I say, not as I do" country? Sometimes it appears that way! Congress—they don’t pay their taxes and they still get appointed to high ranking positions within the government! “Working families across America are struggling in today’s economy, and they need to have confidence that the individual in charge of the House’s tax-writing panel is following the laws the committee is charged with crafting and overseeing. It is improper for Rep. Rangel to remain in a position with such vast power and influence while serious questions about his official conduct continue to multiply and go unanswered. Several weeks ago I wrote a letter to Rep. Rangel asking him to step aside while the Ethics Committee conducts its investigation. He has not done so, and his fellow Democrats have voted to protect him every step of the way. Congress--they have “opted out” of participating in the health care that they are forcing us to accept and it’s been proposed that if we don’t get health insurance (according to them), we’ll pay a penalty or go to jail! Now, we are not advocating breaking the law, we’re just saying, “fare is fare” and if the politicians aren’t going to participate in the health care that they are forcing on us, then we should be able to express our dissatisfaction in a similar fashion (without penalties or jail time) as the “Rangel Rule” would allow. We feel that we should be able to write something similar across the top of our government-issued insurance forms when we declare that we do not want what they are providing! What do you think? What could we write across the top of our insurance forms? How about “Congressional Coverage” or “Representative Repudiation”? We’d love to know your suggestions and urge you to share them with your elected Representatives as well. Summer is gone, but the passion that was alive and well during the August town halls has not diminished. Please continue to write/call/email the White House, Senate, and Congress and let them know how you feel—it does matter and you are making a difference! God Bless America and thanks for your consideration. No! I don't think so....Because did it ever really belong to you in the first place? The picture above kinda makes me angry. What is Jeff Darcy trying to say in this picture? Even Old Glory belongs to the people first ! Correct me if I am wrong. I could spend hours picking apart this pic, but I think you can judge for your self of what picture the liberal media is painting of the Tea Party Patriots. It does not insult me but it does make me want to fight harder, because no matter how much they ignore the Tea Parties, someone is hearing us loud and clear! Tea Party Patriots - Take Ohio Back for Ohio! As we continue the fight to save our country, we must not lose sight of the problems plaguing our state of Ohio. AS we all know, and as numerous reports, studies, and polls show, due to archaic tax laws and business killing policies - Ohio is dying a slow death. As witnessed with our blown state budget, which is now akin to a Grand Canyon size gap, we must also concentrate our efforts here at home. It is time for us to "Take Ohio Back for Ohio"
There is currently a package of 10 "job creating, tax-lowering, student & economic development -friendly" proposals in the Ohio House Economic Development Committee that are not only receiving no attention -- but they are being ignored. We cannot allow this to happen! The Tea Party Patriots and all our fellow conservative groups in OH must save our state from hemorrhaging more jobs and further plunging into an economic abyss - we must Take Ohio Back for Ohio! Employer tax credit to hire unemployed Ohioans: H.B. 277 (Todd Snitchler) would authorize a nonrefundable tax credit for hiring and employing previously unemployed individuals. Ohio businesses that hire previously unemployed individuals will receive a $2,400 tax credit for each such employee that they employ. Each credit will be claimable for up to two years so long as the employee was unemployed for four consecutive weeks immediately preceding their hiring date; the employee is lawfully employable in the United States; and the employee is continuously employed by the employer claiming the credit for a period of two years. Small business capital loans: This bill would authorize the creation of a low to zero interest loan program for small businesses through the local business linked deposit program. Tax credits for Ohio graduates: H.B. 144 (Cheryl Grossman) would grant an income tax credit eliminating tax liability for five years for individuals who obtain a baccalaureate degree and who reside in Ohio. Eliminating the state income tax liability for graduates will allow them to use the extra money to help pay back their student loans and other debts incurred during college, as well as attract college students from other states. Tax credits for specialized crafts: This bill would apply the income tax provisions of H.B. 144 to any person in a trade who has reached the journeyman status or its equivalent. Estate tax relief: This bill would reduce the estate tax, authorize townships and municipal corporations to exempt from the estate tax by initiative any estate property located in the township or municipal corporation, and distribute all estate tax revenue originating in a township or municipal corporation that does not exempt property from the tax to the township or municipal corporation of origin. Small business regulatory reforms – S.B. Companion 3 (Keith Faber): S.B. 3, a package of small business reforms, is currently under consideration in the House State Government Committee and has been under debate since mid-March. In order to expedite passage of S.B. 3’s key provisions, we drafted companion legislation covering three key proposals to help businesses cut through bureaucratic red tape and provide accountability in crafting agency regulations. Small business resource portal: This bill would direct ODOD to create an online small business resource center (expanding upon the existing Ohio Business Gateway) on its internet website, to serve as a clearinghouse of information relevant to Ohio businesses. Tracking job placement success: This bill would require the Ohio Department of Job and Family Services to submit annually to the leaders of the General Assembly a copy of the report submitted to the United States Department of Labor pursuant to the federal Workforce Investment Act and to make a copy of the report available on the department's website. Analyzing company exodus: This bill would require the Ohio Department of Development to produce a report of companies that have relocated out of Ohio, develop a standard questionnaire to elicit the reasons why those companies have chosen to leave Ohio, and share its findings with the legislature. Now -- to get this going, with the same energy we've already shown in our battle against a country-killing Cap & Trade bill and government run health care, we are asking phone calls, emails and letters be sent to Gov. Strickland, OH House Speaker Rep. Armond Budish, Democrat members on the OH House Economic Development Committee & your local OH State Rep's and urge them to put their money where their mouth is when it comes to saving jobs and saving our state! Click here for all Economic Development Committee members. Click here to find your OH House Representative. Cleveland—State Representative Nan Baker (R-Westlake) today unveiled proposals by Ohio House Republicans to spur economic development. Baker and other members of the House Republican Caucus, including Minority Leader William G. Batchelder (R-Medina) and Representatives Ron Amstutz (R-Wooster), Todd Snitchler (R-Uniontown), Dave Hall (R-Killbuck), and Terry Boose (R-Norwalk), revealed extensive plans to bring about job creation and industry growth. The press conference, in conjunction with four other conferences across the state, was conducted to address the failure of the Democrat-controlled Economic Development Committee to conduct regular, productive hearings on the economic condition of Ohio. Frustrated with inaction on the part of Governor Strickland and the Economic Development Committee, Republican members engaged in discussions with the local business community for ideas to revamp Ohio's economy. Based on their findings from market research and conversations with constituents, the House Republicans created a package of proposals that were announced at the press conferences and will be introduced in the coming weeks. Among these ten bills are proposals to offer employer tax credits to hire unemployed Ohioans and to grant income tax credits for college graduates who remain in Ohio. Altogether, these bills are designed to provide resources to small businesses, offer incentives for businesses and young people to remain in Ohio, and track Ohio's progress in rebuilding its economy. The House Economic Development Committee has only met four times since the commencement of the 128th General Assembly and has yet to pass a single bill. The only item to pass out of committee was an ineffectual House Resolution that created the Compact With Ohio Cities Task Force, which focuses on local municipalities rather than the economic health of the entire state. The Ohio Supreme Court ruled the state can continue to collect a business tax when it’s applied to grocery store food sales, avoiding what could have been an $188 million annual hole in the state budget. In a 6-1 decision, the court upheld the collection of the Commercial Activities Tax on food sold by grocery stores and others for offsite consumption. The Ohio Grocers Association had argued that applying the tax to food sales violated the state Constitution, which prohibits sales taxes on the sale of food that’s taken off store premises to eat. The tax amounts to 26 cents per $100 in sales over $1 million, or a flat rate of $150 for the first $1 million in sales, as long as sales are above $150,000. State tax officials estimate the portion of the tax collected on food receipts would amount to about $188 million a year. Lawmakers have called the tax as one levied on the privilege of doing business in Ohio, but grocers argued the payment amounted to a sales tax. And one would presume a State Supreme Court Justice would be smart enough to realize that if the grocery stores are taxed on the total amount of food items they sell then this cost will be passed onto consumers on the un-taxed grocery items they purchase - thus creating a sales tax on groceries. I love how they say you must pay for the "privilege" of doing business in OH. This is just in from Arzella of the Cleveland Tea Party Patriots and the Co-Coordinator for the Grass Roots Rally Team. Cuyahoga Community College invites community members to attend three free lectures by Rev. Robin Hoover, President and Founder of Humane Borders. He will address the topic of Humane Borders: the Moral Argument for Reform. Immigration concerns the whole population and affects newcomers to this Nation. Rev. Hoover's lecture will be particularly interesting and informative to the Hispanic population, which includes a high percentage of relatively new immigrants, and confronts important issues in the border between the U.S. and Mexico. Rev. Hoover will talk about the mission and initiatives of Humane Borders, as well as the issues surrounding immigrants to the United States: legalizing the undocumented; beginning a responsible guest worker program; increasing the number of visas for Mexican nationals; demilitarizing the border; supporting economic development in Mexico, and providing federal social services for the undocumented. We will be meeting with Arzella and the Grass Roots team at 5:30pm and stayin until approximately 6:00pm. Our neighbor's daughter goes to Georgetown University-Washington DC and just received this email, which she forwarded to us. Why is he spending time speaking with students @ Gtown instead of addressing us, here in Ohio? Based on the zip code of your home, it appears that you are either a constituent of (or near since some zip codes are shared by multiple Congressional districts, live near the district of) Congressman Dennis Kucinich, I wanted to make sure you were aware that he is speaking here on campus at the invitation of the group,Georgetown Solidarity Committee. Keeping a Public Option on the Table/. Mr. Kucinich (D-OH) has twice run for U.S. President, both times citing universal health careas the preeminent issue motivating his campaigns, saying, "no injustice is greater in this country than the fact that 30 million people go without health insurance in this, the richest nation in the world." As one of the most vocal advocates for publicly-financed health care, he is currently galvanizing support on Capitol Hill for an amendment to House Resolution 3600. If it passes, this resolution would allow for individual states to adopt single-payer health care systems if they so choose. The address will be an overview of the health care debate from Mr. Kucinich's perspective as well as a legislative update on his amendment (which currently has 86 cosponsors). He will speak for 30-40 minutes to be followed by a question/answer session. The one State Senator willing to stand for something and the one we can continually count on as truly being a voice for OH residents down in Columbus is again fighting to protect our best interest. A strong supporter of the Cleveland Tea Party Patriots & our friend, State Senator Tim Grendell, unlike many other elected officials, see's a problem or something wrong and he acts. Grendell wants to close the loophole in OH law allowing some elected officials & public employees convicted of corruption from collecting thier pensions. State legislators passed the pension forfeiture law last year following a series of public scandals ranging from Ohio Gov. Bob Taft and Coingate to an embezzling downstate sheriff. The crimes triggering forfeiture include bribery, a pattern of corrupt activity and theft in office. But it appears most of the eight public employees found guilty so far in the federal probe have jobs that do not fall within the scope of the state forfeiture law. Only J. Kevin Kelley could be affected -- and only because of his role as an elected Parma school board member, not in his position with the Cuyahoga County engineer's office. Convicted employees must hold jobs of sufficient importance to lose their pensions. Positions include elected officials, members of boards or commissions appointed by the governor or attorney general, public employees required to file disclosure statements with the state, prosecutors and law directors, as well as local and state police. Speaking on the Bob Frantz Show the other evening, Senator Grendell urged everyone to contact your State Senator and ask they join him in sponsoring this legislation. You can find your State Senators contact information by clicking here. Ohio’s politicians certainly receive a lot of campaign contributions from SEIU. This letter was recently sent out from SEIU’s President to their rank and file. "This is a moment of profound change for this country--from kitchen tables to town halls to the floor of the Senate, this nation is engaged in a vigorous and heated debate about how we rebuild our economy, solve our national healthcare crisis and restore the American Dream. "As has always happened when progressive change is in the air, the backlash gets fierce, ugly and anti-American. This time is no different. Right now, there is an insidious and coordinated effort on the part of the extreme right to target individuals and grassroots community groups as a way to silence the voices of women and men who have suffered the most under 8 years of right wing policies. "These extremists will attempt to shut down and shout down anyone with a different point of view. 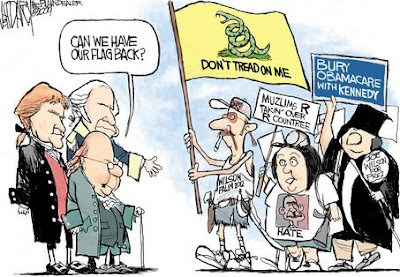 "Let's be clear who we are talking about--call them attack dogs, call them Teabaggers, call them Glenn Beck--these are the same folks who cheered the policies that crashed our economy. Who make up lies about death panels to try to kill healthcare reform. Who scream about democracy while denying workers a voice on the job. Who target anyone who poses a threat to a status quo that for too long has rewarded greedy CEOs while leaving people who work out in the cold. "This is not the America we believe in. "Their lies, their stunts and their smears will not silence us. Glenn Beck, FOX News and their pals have demonstrated that they don't care about what janitors, security officers, nurses, teachers, and other hardworking Americans go through each day trying to give their kids a better future. But make no mistake--these hardworking women and men will not be the next casualty of the cruel and cheap attempts of a loud and venomous minority to silence people who want to restore the American Dream. "We are going to make sure healthcare is affordable and accessible for every man, woman and child in this country. We are going to demand transparency and accountability in the financial industry. We are going to create a fair and just path to citizenship. We are going to make sure workers get a voice on the job. And we will protect our democracy by calling out those extremists who would silence the voices of women and men who work each day." Have these politicians, who were elected by you, the citizens of Ohio, represented YOUR concerns/needs or, the concerns/needs of SEIU and their deep pockets? Brown & Voinovich vote to keep the “pork” flowing! Senate Amendment 2410 would have limited the use of tax payer dollars for a big pork project in Pennsylvania. Mr. Brown and Mr. Voinovich voted “no” to stopping the wasteful spending of our money. We will be contacting both Senator’s offices to ask them to explain their vote. - Washington, DC – Today, U.S. Senator Jim DeMint (R-South Carolina), chairman of the Senate Steering Committee and Ranking Member of the Aviation Subcommittee, announced he will offer an amendment to end taxpayer subsidies for the John Murtha Airport, a little used 650-acre facility in Johnstown, Pennsylvania that has received at least $200 million in taxpayer funding. U.S. Congressman John Murtha (D-Pennsylvania), who the airport was named after, has personally directed $150 million in federal funds to the facility even though it only has 3 flights daily to one destination: Washington, D.C. In May, the House failed to halt funding to Murtha’s airport by a vote of 263-154. • Received $800,000 in stimulus funds this year to repave a backup runway, even though the airport manager says there are no safety issues with the current runway. • Has an $8.5 million radar system paid for by taxpayers, that remains unstaffed and unused. Kucinich & Fudge, What the ????? Attached to that legislation was "The Defund ACORN Act". The final vote was 345 to "defund ACORN", 75 against defunding ACORN, 2 simply stated present and 11 did not vote. Guess who were among the 75 against defunding ACORN? Kucinich and Fudge. Please, for the sake of our country, for the sake of our county, for the sake of our cities, do not forget that these 2 voted to continue giving our tax dollars to ACORN! "The battle, however, to deny ACORN federal funding is not over until the president signs the bill into law. ACORN gave significant support to Democrats and Americans must remain vigilant to avoid backtracking or efforts to water down prohibitions denying Federal funds to this corrupt organization." So now the question is this, we know where the Senate stands, we know where the Congress stands, how long will it be before we know where the President stands on ACORN? We all know there's differing degrees of lying, often one sees it as a little white lie and another calls it bold lie. Most of us agree calling the president a liar during his nationall televised speech is inappropriate. But how many agree it's ok for the president to lie to the nation during a speech? Obama told us the right has been attacking his plan but offer no suggestions and have no plan of their own. He tells us the conservatives want to stand pat with the current healthcare system with no reform. He also told us he's looking forward to alternatives and is willing to sit down and discuss other Bi-patisan suggestions/options but has rebuffed them at every turn. Yet there have been many bills put forward that have been ignored by both the left and the biased media. In many cases ther has been actions to supress them. The GOP has proposed more than 30 health care reform bills in the house this year. Some serious legislation addressing Portability, Pre-existing conditions, costs and other issues that trouble the American consumers. How about HR 3400 that was proposed in July - The empowering Patients First Act or HR 2520 - The Patients Choice Act? HR 3217 and HR 3218 - The Health care Choice Act and the Improving Health Care for all Americans Act? A search of the LexisNexis database of newspapers, magazines, TV programs and Major Blogs finds about 3,000 mentions of the major House Democratic bill HR 3200 that Obama supports, in the past six months. Those are just the stories that refer to the bill by it's House Number, there have been thousands more stories referring generally to the Democratic legislation. A similar search found only 60 mentions of the GOP HR 3400 put forth by Rep. Tom Price of Georgia who heads the the GOP study committee. Another Republican bill, HR 2520 by Rep. Paul Ryan of Wisconsin only received 12 mentions in the same time period. The two others, HR 3217 and HR 3218 by Rep. John Shadegg only received 20 mentions. The virtual media embargo on reporting Republican legislation has allowed democrats and their allies in the media to keep up the "Republicans have no plan" attack. Just hours after the presidents speech, for example, the DNC released a new commercial claiming that Republicans "REFUSE" to offer a plan to reform the healthcare system. Talk about propagating LIES ! Does this look like they are refusing to address the situation or are without suggestions? Today, the Senate voted on the “Gregg Amendment” No. 2361. This amendment would have stopped the use of stimulus money for “self-congratulatory signage” which allows the Federal government to “promote spending of taxpayers’ dollars on stimulus projects”; you’ve probably seen the signs along some of our local highways. Senator Gregg stated that the cost of these signs could be between $6-20 million. The final vote was 52 against this amendment; 45 for the amendment (2 did not vote—Senators from WVA). Can you guess how our wonderful Senators voted? Brown voted against, Voinovich voted for the amendment. Question (which we intend to email Mr. Brown about): Why is it necessary to continue to waste taxpayer’s money on these signs? My posts on this site have been and usually will be about film-making as a Christian and conservative in Hollywood, but because President Obama’s speech the other night was more about theatre and performance than actual policy (speeches have zero to do with the crafting of legislation, which is done in war rooms by politicians who care nothing about rhetoric), I figured I would chime in. This comment drives me insane. Why is offering health benefits “doing right,” but not offering them “doing wrong?” Isn’t the fact that the company even hired them in the first place “doing them right?” Employees know what they’re getting when they get a job, and if they demand health coverage as part of their employment, they can go work for someone else if their boss doesn’t offer it to them. Purchasing health coverage for your employees is extraordinarily expensive; sometimes simply hiring the person is all an employee can afford. Wow. He has big stones to say something like this. For one thing, the reason you’re forced to have auto insurance is to cover OTHERS, not yourself. You’re driving a big dangerous machine, and if you injure someone with it, you better have a way to guarantee payment. For another, auto insurance can be purchased across state lines, so you have true competition. Finally, and most importantly, you’re not forced to drive a car! So if you don’t own a car, you don’t have to get auto insurance! One other thing about forcing people to have health insurance; this, like forcing insurance companies to cover all this preventative stuff, and forcing people to participate in it, is such a nanny state – big brother mentality. Sure, it’s smart for people to be more preventative, but do we want government forcing it on us? Is this freedom? What’s next? Forcing people to work out three times a week and banning sugar? They’re already banning the sale of trans-fats in California and New York and are trying to legally force restaurants to put calorie information on the friggin’ menu. Forcing people to purchase health insurance is lunacy (not to mention possibly unconstitutional), especially considering one of his reasons–”because when someone goes to the emergency room without insurance, we all have to pay for it.” Why is that? Why can’t they get billed? Why shouldn’t they be expected to pay for the cost of being treated? And if they literally can’t afford it because they never got insurance (low cost, high-deductible insurance that covers only big emergencies, like with auto insurance), there are charities/churches/private groups. And if those are unable, then there are extreme and rare cases in which the state can provide a safety net (like with welfare). But that should be the last resort, not policy. Nice little stat there, except he left out two things: One, only 15% of Americans don’t have insurance anyway (notice how he lowered the number of uninsured in this speech from 45 million to “over 30 million,” because he realized that the 45 million figure included illegal immigrants? ), so a better way to say it would have been, “one in three uninsured will sign up for the government option. Two, the Congressional Budget Office he quoted is the same group saying his plan will operate at a deficit, which he denies. So why does he trust the CBO for the stat above? “Public universities don’t hurt private colleges, so public insurance won’t hurt private insurance” (paraphrase). Hmm. Well, that’s partly true, except the difference is that there are thousands of different public universities to choose from, which means they compete with each other, whereas President Obama’s proposing one government plan. Also, most public universities are state run and funded, not nationally run and funded. And again…NO ONE’S FORCING ANYONE TO GO TO COLLEGE, whereas President Obama wants to force you to have insurance, so again, it’s a crappy metaphor. Then why ever get insurance in the first place? Oh, never mind, he’s going to force you to do it. Forgot that part. It already is. Let me repeat that. It already is. As long as you make timely payments, it’s against the law for an insurance company to simply drop you because you got sick. To close, President Obama has been making some very interesting statements about Medicare. I’ve been attacking Medicare in health care debates for awhile. I’ve used it as an example of a poorly run government program that should scare us from wanting government to have a bigger role (along with FEMA, DMV, post office, etc.). And my liberal friends usually respond by defending Medicare, pointing out its high approval ratings and efficiency. Well, I appreciated President Obama tonight acknowledging that Medicare is a problem, because he said that one of the biggest ways the government option would be paid for is with the elimination of waste and fraud in Medicare. We’re going to pay for this new big government program by eliminating all the mess and mistakes from the other one. Yes, the other program has wasted HUNDREDS OF BILLIONS OF DOLLARS, enough to nearly pay for this new program, but trust me…we’ll do this one better. President Obama said something similar about the post office, another government program we on the right attack. He said, “Government competition hasn’t hurt FedEx and UPS; in fact, it’s the post office that usually has the problems.” Um…so this is supposed to give us confidence in your new government program? Not all President Obama said was bad. And of course, the beginnings and ends of his speeches are always great, and I’m guessing support for him and the plan will go up in the next week based on this speech. But most likely it’ll return to earth in a couple weeks, and we’ll be back where we started. September 11, 2001 - We'll never forget! This past summer, we visited Shanksville, PA and the memorial to the heroes of Flight 93. We thought we’d share a few photos with you as we remember all those who lost their lives on September 11, 2001. *In case you've never been here, the flag in the middle of this field marks the hallowed ground of Flight 93. As health insurance reform is debated in Congress, U.S. Senator Brown wants to hear from you. In addition to forums on health insurance reform Senator Brown held in Ohio during August, Senator Brown will hold an electronic town hall TONIGHT, September 10, 2009 from 6:30pm to 7:15pm. This forum will allow Ohioans from all across the state to participate and ask questions of Senator Brown directly. Senator Brown will answer as many questions as time permits. To view the Live E-Town Hall tonight at 6:30pm, please click here. Dem's not wasting any time! Ours is not the first generation to understand the dire need for health reform. And I am not the first president to take up this cause, but Iam determined to be the last. Unfortunately, as this fateful and sacred day in our country’s history nears, instead of being respectful by honoring, commemorating and remembering the victims and their family and instead of putting partisan politics away for a day, the Ohio Republican Party insists on donning their Elephant lapel pins and going to work. In the most disgraceful way, the State Central Committee for the Ohio Republican Party will be meeting at 10:00AM on Fri. 9/11 at the Hilton Polaris (8700 Lyra Dr. / Near the Polaris Mall) to give out state party endorsements for the May 2010 primary. After speaking with quite a few other Cleveland Tea Party Patriots (CTPP) who were also upset about this meeting, I contacted Chairman DeWine’s office to express our concerns. I identified myself as one of the CTPP coordinators, and that I was calling with some concerns about an upcoming endorsement meeting. Furthermore, it was stated that we feel party endorsements should not be given out in primary races and that the candidates should be elected on the merits of their accomplishments and/or their proposed platforms. I then requested, that if the endorsements must be given for primary races, that at least in good taste, the endorsement meeting should rescheduled for another day. As we can clearly see, while the OH GOP claims they hear our Tea Party Patriot message that -- we are free-thinking conservative voters, we don’t need their direction & are tired of being told who to vote for -- their actions do not show it. If you feel it is disrespectful and offensive to meet and give out party endorsements on 9/11 and you do not to need to be told who to vote for - we are urging you to contact the OH GOP Chairman Kevin DeWine, all 88 County GOP Chairman and all GOP State Central Committee members and ask that the endorsement meeting be canceled on this sacred day and no endorsements be given out for any primary races. If the OH GOP Chairman DeWine refuses our requests we will request that any candidate, in honoring the victims and the heroes that stood up for our freedom on that sacred day, refuse the endorsement on the grounds that 9/11 should be national day of remembrance free of partisan politics. 2.) Call your Republican Party County Chairman (from the list below). Leave brief message with your opinion on the endorsement meetings. Can’t make the 9/12 March on D.C.? Your student might need a sick day on Sept 8th!